York: York Minster Cathedral, 0.2 mi. Hull: Boothferry Park Weather Cam, 31.9 mi. Burnsall: River Wharfe at Burnsall, 35.8 mi. Piercebridge: River Tees at Piercebridge, 46.5 mi. Hawes: Market Place Hawes, 51.1 mi. 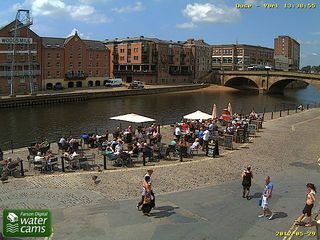 This webcam York with the theme Rivers was added on May 29, 2012 and is operated by Farson Digital Watercams. It got 47948 visitors since then. Shouldn't this webcam work or should the link be wrong please report that here. You can add this webcam here to myCams.